Located about 10 miles south of Cimarron, New Mexico on Highway 21, Rayado was founded by Lucien B. Maxwell in 1848 at the end of the Mexican-American War, as the first settlement in Colfax County, New Mexico. Rayado, which means “streaked” in Spanish, was perhaps named so for the beautiful cliffs close to the settlement. Maxwell had married Luz Beaubien, the daughter of the wealthy landowner Carlos Beaubien in 1842. Beaubien was one of two holders of the enormous Beaubien-Miranda Land Grant. Maxwell eventually bought out Miranda’s share of the grant and inherited the other half, becoming the owner of the largest single tract of land ever possessed by one man in the history of the United States – over 1.7 million acres. In addition to his land holdings, Maxwell was also a trader, Indian Agent, and cattleman. Maxwell built a house in his new community and soon tried to convince his friend Kit Carson to move down from nearby Taos, New Mexico in 1849. 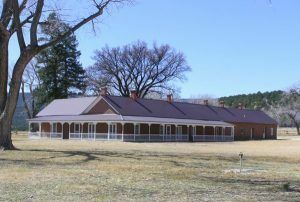 Carson had invested $2,000 in a ranching and farming enterprise in the area, and he and Maxwell purchased stock and seeds and hired workers to erect buildings on Rayado Creek. However, Carson was reluctant, as the area was exposed to Plains Indian raiders and his wife, Josefa, had just given birth to a new baby. However, he did build a small house there. As Rayado was located at the point where the Mountain Route and the Cimarron Cutoff rejoined, both Carson and Maxwell entertained a number of Santa Fe Trail traders. Though it was the only settlement for miles around, Maxwell had difficulty in attracting settlers as the area was subject to raids by the Apache, Comanche, and other Plains tribes. In April 1850 Rayado was raided by Jicarilla Apache Indians, who stole horses and seriously wounded two Mexican herders. From nearby Taos, New Mexico, Captain W.N. Grier of the 1st Dragoons, sent out Sergeant Willaim Holbrook to protect the settlement. Riding with Holbrook were Kit Carson and two other frontiersmen named William New and Robert Fisher. After following the Indians’ trail for 25 miles, the soldiers found the camp of nine unsuspecting Apache Indians. At daybreak on April 6th, Holbrook charged in, killed five of the Apache, wounded two others, and recaptured the stock. Afterward, a federal garrison post was established at Rayado that lasted until Fort Union was established the following year. 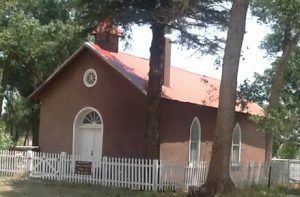 In 1857, the settlement of Cimarron is established and Maxwell soon moved headquarters there. In the meantime, Jesus Gil Abreu, who also married a Beaubien daughter, built a ranch house along the banks of the Rayado Creek in 1859, which he lived in until his death in 1911. Rayado gained a post office in 1873 which lasted until 1919. Today, Rayado is part of the Philmont Scout Ranch and includes the original Maxwell home, a reconstruction of Carson’s home, the Chapel of the Holy Child, and La Posta, a Santa Fe Trail stage stop dating from the 1850s. 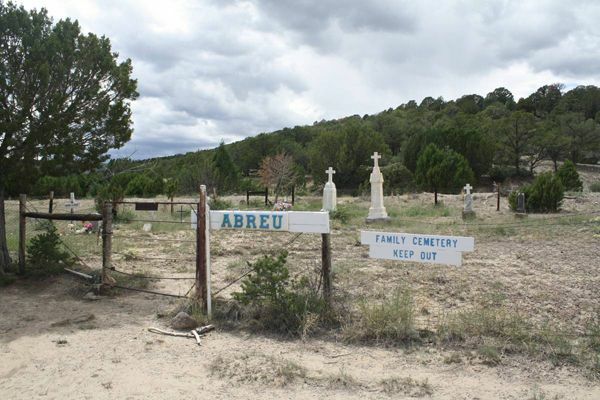 Nearby is the old Abreu family cemetery.